Understanding pain in runners: Are we running behind the times? ” A piece of shrapnel sliced the right side of his face and cut through his chest, breaking his collarbone”. However, despite the severe tissue injury and damage, he felt no pain in the initial aftermath of the injury. However there is a twist in the tale! Please note the picture below contains a graphic image of an injury. Thankfully, many experimental studies have since supported these anecdotal accounts of a disconnect between tissue injury and pain. Today, pain is best understood as a perception, that is produced by the brain in response to perceived threat or danger (Moseley, 2012). At a most fundamental level, pain is an extremely sophisticated device that ultimately promotes survival (Crook et al. 2014). Our body tissues contain what can be considered “danger sensors” (scientifically termed nociceptors) that can alert the brain to “issues in the tissues” which in runners, can be the result of excessive training loads, altered biomechanics, reduced strength & conditioning etc. In the presence of inflammation which results from tissue injury, these sensors become more sensitive and fire more readily (Basbaum et al. 2009). In many cases, pain will be experienced if the brain decides that protecting the painful body part is the most important thing for survival. For example, the pain of “shin splints” could mean that the bone and/or surrounding tissues is being subjected to too much stress. However under some circumstances, even in the presence of significant tissue injury, pain could impede survival and this explains why sometimes in the presence of severe tissue damage, the individual does not report significant pain. Consider the soldier that was injured in battle-it is quite conceivable that escape from the threatening environment (i.e. battlefield) was prioritised over protecting the injured tissues and this could explain the failure to experience much pain in the initial aftermath following the injury. So the brain literally weights up the options! Importantly the body tissues have NO ABILITY to produce pain by themselves. Instead, they send information to the brain and ultimately the brain make the final decision on what to do. As part of its decision making process it considers many other pieces of information i.e. the context surrounding the injury (where it happened, how it happened, any immediate danger other than the tissue injury, previous similar injuries and their outcome). In reality, the brain can decide whether action is needed or not in response to the danger messages from the tissues depending on the specific circumstances. (Wiech et al. 2014) Sometimes it gets it right and other times it may get it wrong! Pain in runners: Injury, sensitivity or both? The above examples are not to suggest that tissue injury or damage are not important in the experience of pain in runners. The common cluster of running injuries (knee pain, IT band, “shin splints”) would suggest that “issues in the tissues” are at least in part responsible. Training errors, muscle weakness/imbalance/flexibility issues and running biomechanics can all potentially “sensitise” the danger sensors in our tissues by triggering inflammation in response to tissue overload etc. As mentioned previously, this “danger” information is sent to the brain for further processing and pain can be the response in an attempt to get the runner to take note and address the issue (ensure rest, appropriate rehabilitation etc.). To complicate matters, as the danger message travels to the brain, the message can be “edited” (turned up or suppressed) as it passes through the spinal cord. It is now well established in the literature that factors like poor sleep (Schuh-Hofer et al. 2013), negative expectations (Bingel et al. 2011; Kessner et al. 2014), worry, anxiety, depression (Ligthart et al. 2013; 2014), fear (Crombez et al. 2012) , stress (Chen et al. 2011; Fagundes et al. 2013; Scott et al. 2013) and negative beliefs about the injury (Wiech et al. 2008; Wertli et al. 2014) all have the capacity to amplify the danger messages. Therefore the brain is alerted to more “danger” than there actually is and the pain response may not reflect the degree of tissue injury. Such factors can “pre-sensitize” our nervous system so that even minor changes in the tissues could result in a pain experience (Denk et al. 2014). This leads to the important conceptual difference between pain and injury. Although injury (i.e. Tissue damage) is often associated with pain, it is not necessary for the experience of pain. Factors such as poor sleep, stress and anxiety (termed “stressors”) can sensitize our “danger sensors” even when no tissue injury is present. Pain in such circumstances can be considered a reflection of increased “sensitivity” of the nervous system and not tissue damage. With this in mind, it stands to reason that solely addressing the tissue health without consideration of these additional factors would lead to poorer outcomes. It is my opinion that the term “sensitivity” is more accurate than “injury”, the latter referring specifically to structural damage with little or no consideration of the plethora of other non-physical factors known to influence pain. The term “sensitivity” does however acknowledge that physical factors may well be contributing to the pain experience. I mentioned previously how the brain can process and interpret the “danger” messages differently depending on context. Most runners understand their pain from a strictly biomechanical perspective and the well meaning clinician often emphasises what they are not doing well or are deficient in (too tight, not strong enough, poor movement, poor running mechanics etc). This is potentially “threatening” information that the brain can use as part of its decision making process and can result in the “danger messages” being amplified or interpreted as more dangerous than they really are (Legrain et al. 2011). Moreover runners gather information about their pain from different sources (Internet, fellow runners, previous experiences, clinicians) and all of this can have a significant impact on the pain that they feel. Basically, the more threatening or negative the information is, the more pain. In a similar manner to pain, recent research has confirmed that fatigue experienced during a race is not a simple reflection of what is happening in the muscle. Instead research has shown that listening to music, prior positive experience, knowledge of competitors, knowledge of proximity to the finish line etc. all have the capacity to influence fatigue and regulate performance (Noakes 2012). It’s the brain that’s the ultimate governor of pain, fatigue and performance. 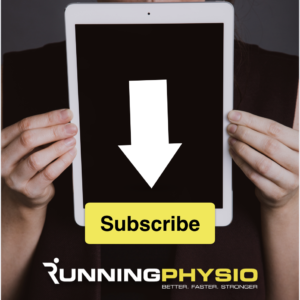 Managing running related pain-time to think outside the joint! There should be no recipes when it comes to addressing running-related pain. A good treatment plan always begins with a good assessment. Importantly however, while an assessment of the physical factors (training loads, previous injury, progressions, biomechanics, strength, flexibility etc.) is important, a “bigger picture” perspective is required. Based on our modern understanding of pain, a thorough and evidence-based assessment should consider the following (Vibe-Fersum et al. 2013; Jones & O’Shaughnessy 2014). Individual factors (such as previous experiences, previous injury & coping styles). All of the above have the capacity to influence pain at many levels (Simons et al. 2014). The sensitivity of our “danger sensors” and our nervous system in general changes based on these factors regardless of whether there is any demonstrable tissue damage or injury. Furthermore, when danger messages are sent from the tissues, all of the above factors can change how the brain “interprets” these danger messages (Ursin 2014). Of course, assessing and managing the physical factors such as training loads, biomechanics, strength and conditioning etc is still important. However this “big picture” view is what in my opinion is missing from the current research literature on running related pain. A shift from a purely biomechanical understanding of pain in runners to a neuroscientific understanding will undoubtedly be a worthwhile development. Getting the pain (or pain relief) you expect? Where “issues in the tissues” (due to strength deficits, altered biomechanics etc.) are a significant factor in a runner’s pain, then these need to be addressed through a structured exercise-based rehabilitation programme. There is however an emerging trend for runners to rely on interventions which are unlikely to change structure or improve the health of tissues. These include (but not limited to) foam rolling, tape, massage, creams, oils, and manual therapy. Such interventions are often popularised by positive testimonials by well meaning runners and clinicians. Runners should recognise that the perceived pain relief achieved with such interventions is often short-term, driven by changes to sensory information processing (danger signals are suppressed) with positive expectations associated with the treatment (based on personal beliefs, an enthusiastic therapist etc.) being a key factor associated with the pain relief. Runners (and clinicians) need to be aware that the beliefs and expectations they attach to specific treatments will influence their response to that treatment. There is a large body of research evidence which clearly shows that positive expectations can lead to pain relief with a variety of treatments (Tracey 2010; Bingel et al. 2011; Schenk et al. 2014). Importantly this is relevant to all treatments including tape, foam rolling, strength training, gait training etc. and it’s not apparent that many of the intervention studies have considered the role of expectations. Of course, any treatment that reduces someone’s pain is always important. However if such treatments are at the expense of treatments that are more likely to result in long term improvement (due to changes in strength, biomechanics etc. ), then this is clearly a problem. Importantly, pain relief does not imply that the tissues have changed or were involved in the pain in the first instance. We need to keep an open mind on how some of intervention “work” particularly if they are “novel” or “trendy”. Expect pain relief and you’ll probably get it! Placebo controlled studies and studies with long term follow-ups are not plentiful in the running literature. The effectiveness of many interventions above and beyond a placebo remains to be established, irrespective of how plausible the proposed mechanisms seem. In summary, the answer to the question “why do I hurt?” is complex. The traditional focus and emphasis on the physical demands of running are in my opinion misguided and insufficient to answer this question. Emerging research on pain has emphasised the need to focus on broader issues across physical, lifestyle, cognitive, social and psychological domains. Running related pain can be likened to a Jigsaw puzzle. It is composed of many pieces that fit together in a specific way to complete the picture. Everyone’s picture is different, some pieces are more important than others but the picture is only complete with all the pieces. It is it job of the runner and the clinician to identify what these pieces are for each individual and design a rehabilitation programme accordingly. On a final note, here is a clip on the great Ethiopian Haile Gebrselassie. It explores how he ran to Olympic gold in the 1996 Olympic Games in Atlanta despite ongoing Achilles pain going into the race. A real-life example of how the context around “injury” will ultimately determine the amount of pain you feel or how significant the loss of function is. His brain was likely more concerned with an Olympic gold medal!! There is no clear relationship between “injury” and pain. More injury does not necessarily mean more pain and vice versa. The next time you feel pain,ask the question: Am I injured or am I sensitised? Of course it can be both as is often the case. To better manage your pain/injury, it is essential to consider the “big picture” in addition to the traditional physical factors such as strength, biomechanics, flexibility etc. Moseley, G. L. (2012). Teaching people about pain: why do we keep beating around the bush?. Pain management, 2(1), 1-3. Crook, R. J., Dickson, K., Hanlon, R. T., & Walters, E. T. (2014). Nociceptive Sensitization Reduces Predation Risk. Current Biology, 24(10), 1121-1125. Basbaum, A. I., Bautista, D. M., Scherrer, G., & Julius, D. (2009). Cellular and molecular mechanisms of pain. Cell, 139(2), 267-284. Wiech, K., Vandekerckhove, J., Zaman, J., Tuerlinckx, F., Vlaeyen, J., & Tracey, I. (2014). Influence of prior information on pain involves biased perceptual decision-making. Current Biology, 24(15), R679-R681. Schuh-Hofer, S., Wodarski, R., Pfau, D. B., Caspani, O., Magerl, W., Kennedy, J. D., & Treede, R. D. (2013). One night of total sleep deprivation promotes a state of generalized hyperalgesia: A surrogate pain model to study the relationship of insomnia and pain. Pain, 154(9), 1613-1621. Bingel, U., Wanigasekera, V., Wiech, K., Mhuircheartaigh, R. N., Lee, M. C., Ploner, M., & Tracey, I. (2011). The effect of treatment expectation on drug efficacy: imaging the analgesic benefit of the opioid remifentanil. Science translational medicine, 3(70), 70ra14-70ra14. Kessner, S., Forkmann, K., Ritter, C., Wiech, K., Ploner, M., & Bingel, U. (2014). The Effect of Treatment History on Therapeutic Outcome: Psychological and Neurobiological Underpinnings. PloS one, 9(10), e109014. Ligthart, L., Gerrits, M. M., Boomsma, D. I., & Penninx, B. W. (2013). Anxiety and depression are associated with migraine and pain in general: an investigation of the interrelationships. The Journal of Pain, 14(4), 363-370. Ligthart, L., Visscher, C. M., van Houtem, C. M., Geels, L. M., Vink, J. M., de Jongh, A., & Boomsma, D. I. (2014). Comorbidity Among Multiple Pain Symptoms and Anxious Depression in a Dutch Population Sample. The Journal of Pain, 15(9), 945-955. Crombez, G., Eccleston, C., Van Damme, S., Vlaeyen, J. W., & Karoly, P. (2012). Fear-avoidance model of chronic pain: the next generation. The Clinical journal of pain, 28(6), 475-483. Chen, X., Green, P. G., & Levine, J. D. (2011). Stress enhances muscle nociceptor activity in the rat. Neuroscience, 185, 166-173. Fagundes, C. P., Glaser, R., & Kiecolt-Glaser, J. K. (2013). Stressful early life experiences and immune dysregulation across the lifespan. Brain, behavior, and immunity, 27, 8-12. Scott, K. M., Koenen, K. C., Aguilar-Gaxiola, S., Alonso, J., Angermeyer, M. C., Benjet, C., … & Kessler, R. C. (2013). Associations between Lifetime Traumatic Events and Subsequent Chronic Physical Conditions: A Cross-National, Cross-Sectional Study. PloS one, 8(11), e80573. Wiech, K., Ploner, M., & Tracey, I. (2008). Neurocognitive aspects of pain perception. Trends in cognitive sciences, 12(8), 306-313. Wertli, M. M., Burgstaller, J. M., Weiser, S., Steurer, J., Kofmehl, R., & Held, U. (2014). Influence of Catastrophizing on Treatment Outcome in Patients With Nonspecific Low Back Pain: A Systematic Review. Spine, 39(3), 263-273. Denk, F., McMahon, S. B., & Tracey, I. (2014). Pain vulnerability: a neurobiological perspective. Nature neuroscience, 17(2), 192-200. Legrain, V., Iannetti, G. D., Plaghki, L., & Mouraux, A. (2011). The pain matrix reloaded: a salience detection system for the body. Progress in neurobiology, 93(1), 111-124. Vibe Fersum, K., O’Sullivan, P., Skouen, J. S., Smith, A., & Kvåle, A. (2013). Efficacy of classification‐based cognitive functional therapy in patients with non‐specific chronic low back pain: A randomized controlled trial. European Journal of Pain, 17(6), 916-928. Jones, L. E., & O’Shaughnessy, D. F. (2014). The Pain and Movement Reasoning Model: Introduction to a simple tool for integrated pain assessment. Manual therapy, 19(3), 270-276. Simons, L. E., Elman, I., & Borsook, D. (2014). Psychological processing in chronic pain: a neural systems approach. Neuroscience & Biobehavioral Reviews, 39, 61-78. Ursin, H. (2014). Brain sensitization to external and internal stimuli. Psychoneuroendocrinology, 42, 134-145. Tracey, I. (2010). Getting the pain you expect: mechanisms of placebo, nocebo and reappraisal effects in humans. Nature medicine, 16(11), 1277-1283. Schenk, L. A., Sprenger, C., Geuter, S., & Büchel, C. (2014). Expectation requires treatment to boost pain relief: An fMRI study. PAIN®, 155(1), 150-157. Previous articleWhat causes running injuries?